Chances were early for both sides as the match got under way. In the 4th min early pressure from Dundalk down the right ends with Mc Millan shooting just wide. Seani Maguire scores in 19th min to make it 1-0 to City as he gets in at the near post. It was an action packed first half with City denied a penalty for a clear handball in the box as the ball came off the left arm of the Dundalk Captain Dane Massey. City were awarded a corner instead. Also Ryan Delaney for Cork had a header cleared off the line shortly after. at the 45th minute the stroke of half time A Yellow card for Paddy Barrett. Fouling Maguire in midfield. The second half got under way and started again with a quick pace to the play. In the 54th min City’s Mc Nulty plucks Vemmelund’s header out of the top corner with a fine save to deny Dundalk an equaliser. Dundalk’s free kick from 30 yards in the 60th min ended no where as the cork wall done its job. Sean Maguire makes it 2-0 in the 70th minute. A close range finish from the striker following a Dunleavy cross. From then on City controlled the pace of the game keeping the ball and passing well. 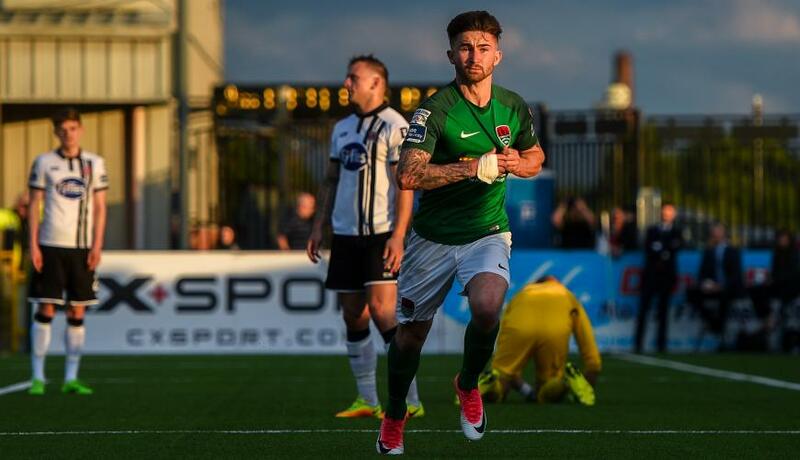 With 4 minutes added time In the 93rd minute Seani Maguire scored a late goal from a defensive error in the Dundalk box pouncing on the loose ball to make it s hat trick for himself. The match finished up 3-0 to cork city with a great performance from City as a team. Man of the match is Seani Maguire with his Hat Trick and outstanding performance.